Samia Yabah Nkrumah is on a mission to promote African unity to achieve effective democracies and economic growth that benefits all. .
Rhodes, Greece — In an exclusive interview, Samia Yaba Nkrumah explains why a more profound African unity is needed to achieve the benefits of democracy - economic growth and prosperity for all. Rhodes, Greece - One can get star-struck when conversing with Samia Yaba Nkrumah. Her passion for pan-Africanism and the development of the continent to ensure equality for all Africans is palatable. The former MP for the Jomoro constituency is also the daughter of the Dr Kwame Nkrumah, who led Ghana to independence from Britain in 1957. 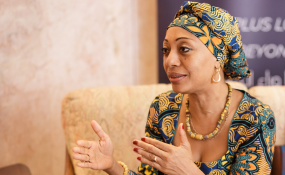 In 2011, Samia Nkrumah was elected to lead the Convention People's Party - the first woman to lead a political party. She has since retired from active politics as an MP but is now heading the Kwame Nkrumah Pan-African Centre - on a mission to revive her father's ideas of pan-Africanism and African unity. President Nkrumah famously said: "We face neither East nor West: we face forward; We prefer self-government with danger to servitude in tranquillity." And it's this ethos for a better continent that Nkrumah wants to focus on, as she outlined her thinking at the Dialogue of Civilization conference on the Greek Island of Rhodes. "We are practising democracy in particular environments and millions of people's needs are not being met. We call elections season in Ghana 'cocoa season' – it's the time people make money!" Nkrumah said during her talk titled Economic Inequality and Democracy: Are They Compatible?. Nkrumah said she wants democracy to translate into "tangible" things: "I want it to eradicate poverty, more sanitation, adequate water for all, reliable power supply. We are thinking of the outcome of democracy and not just the right to exercise the right to vote." The comeback kid: IMF back in Africa? Nkrumah is scathing about her critique on the IMF structural adjustment programmes of the 1980s that left countries cutting back on education, health and infrastructure projects. "They really set us back, they truly set us back, these prescriptions imposed on us from the outside without true knowledge of what was happening on the ground and the figures show it did not work," says Nkrumah. During the eighties and nineties' debt crisis many African countries turned to the IMF and the World Bank for financial bailouts and this came with strict conditions. She says these loans did not help the growth of African economies "at all". "It was never inclusive growth and it did not trickle down, and it affected our investment in health and education." But since the 80s, some states have become more indebted and the 2008 financial crisis coupled with the collapse of commodities did not help the continent. It is estimated that about 24 out of 50 low-income countries are currently in debt and that number has doubled in the past five years. "Countries are going back to the IMF and truth be told we never ever stopped. It is so difficult to service the debt and our small economies and credit rating is so down and it is more expensive for us to borrow." Nkrumah says it's a vicious cycle that has to stop somewhere - "sooner or later people will be so fed up and explode". In 2014, 15 African countries had IMF loans, worth a total of $5.39-billion. And now in 2018, it's 20 countries with loans totalling $15.4-billion. Countries like Zimbabwe, Angola, Mozambique and the Republic of the Congo continue knocking at the international lenders' door. Nkrumah says Africa and Africans must have the freedom to choose the policies that suit their particular context so that the continent has more control over its economies. "I mean honestly you would not starve yourself if you have control. Africa needs to have full sovereignty to make certain decisions to put the majority of people first," says Nkrumah, who argues that the scramble for Africa has intensified. "There has always been a scramble because the potential here is so huge, meaning we have not explored what we have and we cannot give our resources away for anything. And judging by the statistics, China is the new sugar daddy for African states but some say it comes at a price, perhaps not as prescriptive as the IMF and Bretton Woods institutions but nevertheless has strings attached," she said. According to statistics, the Chinese interest-bearing loans rose from almost zero in 2000 to $18-billion in 2013 and then $30-billion in 2016. This is part of the billions of dollars in overall financial support to Africa. Nkrumah says if Africa speaks with one voice it can be more powerful in negotiating loans and deal with, for instance, China. "All this cannot happen if we are weak states, there is no way you can negotiate favourable things for your people. We advocating for States working together to get the best deals for the people, the best way to regulate the scramble." Nkrumah says this is a continent where everyone is coming for the resources, and she believes if things are not fair sooner or later tension will grow within populations and countries. "Sixty percent of arable land is here in Africa and that is where everyone is coming and is going to come, and it has to be well managed," she says. Some might say Nkrumah might be naive in her response to the burning issues some states are facing but she believes, like her father, that unity for Africa is essential. "Our unity is a great contributor to peace and Africans need to take charge - A new Africa has to be born." Nkrumah says there will always be problems if Africans do not have unity of purpose and it can be facilitated by political union. "We need to visit the original idea. We were never meant to struggle; African states must work together - it will be better for the world."